It is a border between China and Pakistan - referred to as the world's highest paved border crossing, in the Karakorum Mountains. feet, outnumber cargo trucks will be crossing over Pakistan's border with China. The initial outlines of this corridor are already visible, where the highway snakes past mountains, glaciers, and rocky valleys. From central Pakistan, more roads will be built to provide access to Gwadar Port in Baluchistan. The donkey-trails from the original Silk Route is visible, where traders traveled for more than 600 years before the 15th century. China spends millions of dollars on the upgrading of mountainous Karakorum highway that is one of the world's most dangerous roads. Chinese engineers are drilling through mountains to build dozens of miles of tunnels to make it safer, some of which are celebrated with the phrase "Pak-China Friendship Tunnel". They are adding bridges, guardrails and concrete overhangs to funnel landslides and avalanches away from travel lanes. For example, Attabad Lake is created as a result of a landslide in 2010, which blocked the Hunza River and caused flooding the Karakorum Highway and surrounding villages. China has recently built four large tunnels on the south end of the 13-mile lake to reopen the highway that also benefits the water locked local villagers. Pakistan benefits from its strategic location and China is taking advantage of that. 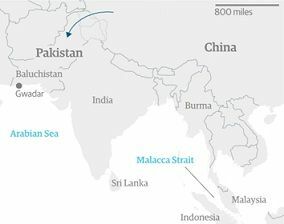 Around 80% of China's trade and energy imports travel through the pirate-swarmed Strait of Malacca and Indian Ocean, both patrolled by the United States and Indian Navies. These possible chokepoints at Malacca Strait are a security issue for China, particularly regarding oil as 40% of china's general consumption passes through the Malacca Strait. 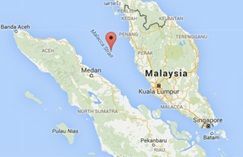 Any conflict could block the China's energy supply, as a result, supply ships would need to travel an extra 500 miles to avoid the Malacca Strait, currently the fastest route from the Indian Ocean to the Pacific. China is aware of this vulnerability and is looking to Pakistan to provide a shorter and safer alternative. Currently China import 80% of its oil through this narrow strech of sea passing through Malaysia, Indonasia, and Singapore. The CPEC would not only be the alternative to Strait of Malacca but also provide China with an entry point to the Persian Gulf. Strategically some countries are worried that the China is broadening its geopolitical influence and possibly its military presence in the region. For example, some Indian intellectuals suspect the Gwadar port will serve as a Chinese Naval facility, and it only comes at a cost of about $46 billion.